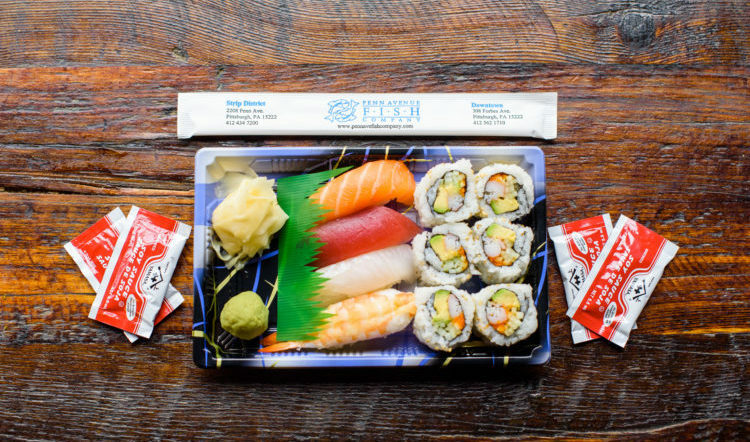 Fresh sushi to go. Photo courtesy of Penn Cove Eatery. Pittsburgh’s emerging reputation as a foodie hotspot almost has us forgetting this was the place known for putting fries on top of sandwiches and salads. Among the latest wave of new (and newly relocated) dining destinations aiming to please are these five, all of which have our mouths watering. Henry Dewey and Angela Earley, the pair behind Strip District stalwart Penn Avenue Fish Company, have cast their nets upon the Downtown lunch crowd with the opening of Penn Cove Eatery. Open from 11 a.m. to 3 p.m. Monday through Friday, this fast casual spot specializes in grab-and-go soups, salads, sushi and other seafood dishes. Gourmet sandwiches, including the Baja Cod Wrap topped with provolone cheese, fresh arugula, cabbage, cilantro salsa, tartar sauce and sriracha, range in price from $9.50 to $12.50. The adjacent bar, The Warren, doubles as a wine shop and will feature a nighttime pub menu from 5 p.m. to midnight Sunday-Thursday and 5 p.m. to 1 a.m. Friday and Saturday. A luscious pie at Driftwood. 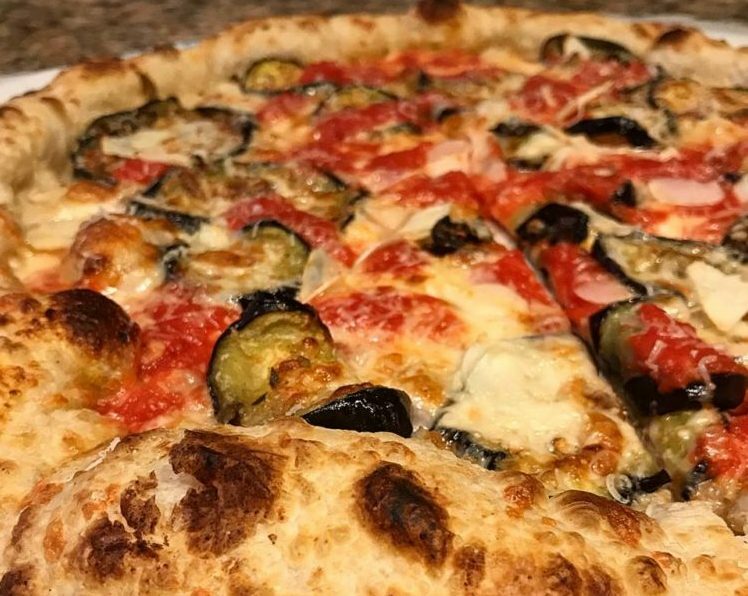 After two years on the road, Driftwood Oven, a popular roving pizza shop known for its wood-fired sourdough pies, has found a permanent parking spot in Lawrenceville. Thanks to a successful Kickstarter campaign that raised nearly $30,000 in a few days, owners Neil Blazin and Justin Vetter were able to open a brick-and-mortar store on Butler Street. A soft opening was held in late February, when guests were treated to everything from classic pepperoni to the Beetza, a pizza featuring roasted beets, caramelized onions, ricotta cheese, Buttercup Cheese, Crème fraîche and chives. The shop is open Thursday – Sunday, but the pair plans to expand their hours once a liquor license and their tap system are in place. 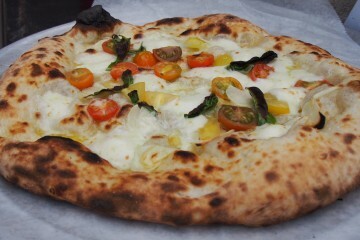 Blazin and Vetter, who met while working in the kitchen at Legume in Oakland, use organic, locally sourced ingredients. And if the Beetza is any indication, they aren’t afraid to experiment with their slices. Mussels from the Brugge team. The bustling North Side is getting a taste of Belgium. This spring, Brugge on North @ Alphabet City will replace Casellula in the former Masonic Hall that now houses City of Asylum’s bookshop and event space. Husband-and-wife team Jesse and Amy Seager, who run Point Brugge Café in Point Breeze and Park Bruges in Highland Park, teamed up with City of Asylum CEO Henry Reese to create their third location. While the fare will be similar to its sister restaurants — think Belgian-inspired faves such as steak frites, Carbonnade Flamande and Crispy Duck Leg Confit — expect a cultural aspect to the new endeavor. Literary events will make the space a community hub that just happens to offer gourmet eats. Hot dishes being crafted at Carmi. The South Side bar scene now has a bit of soul. Carmi Soul Food Restaurant recently opened on 18th Street after moving from its long-time home on Western Avenue. 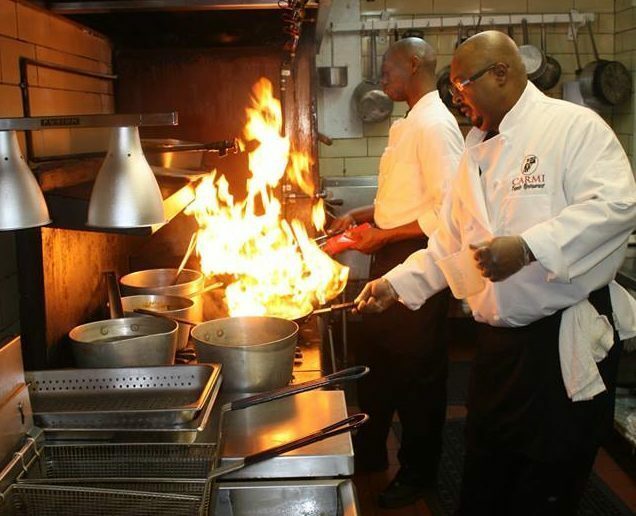 Chef Michael King and owner Carleen King spent a decade perfecting their homestyle recipes in the catering business and now offer traditional soul food — barbecue short ribs, chicken and waffles, shrimp and grits, shrimp Po’ Boys — with contemporary flair. Carmi also offers catering services and hosts private events. Poulet Bleu serves up French style and sophistication in the heart of Lawrenceville. Like other Richard DeShantz Restaurant Group offerings such as the Downtown hotspots Meat & Potatoes and Butcher and the Rye (and a forthcoming eatery called Fish Nor Fowl, plus an as-yet-unnamed new French spot also in Lawrenceville), the new bistro is a feast for the eyes as well as the stomach. 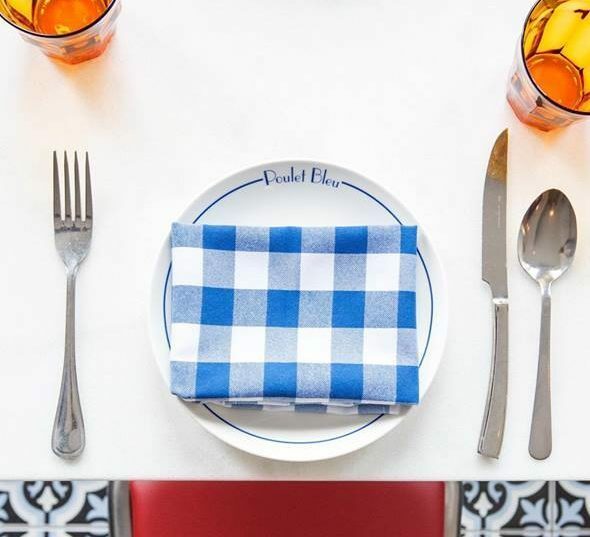 Bleu accents punctuate the sleek eatery which includes a romantic outdoor courtyard. Diners can enjoy filet mignon in a Bordelaise sauce served with pomme frites or try Bayonne ham, foie gras, oysters Rockefeller or lobster spaghetti. Cap off the night with a chocolate soufflé for two made with banana ice cream, cherry compote, pineapple, crème Anglaise and chocolate sauce. Sunday brunches begin on April 1. The busy owners were recently nominated as semifinalists by the James Beard Foundation for Outstanding Restaurateur.